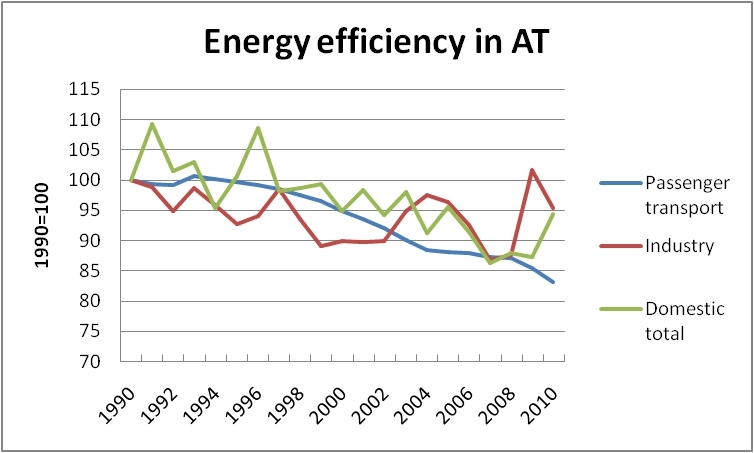 In a recent posting we had a closer look at the development of energy efficiency in the UK. Then we found that various sectors of the economy have been performing differently over the years. Some sectors managed to lower their energy hunger drastically, while others were much less successful. Now we are going to look at the situation in Austria. There, too, has been much talk about the need to save energy. But how much of that has actually materialized into lower consumption or, to put if differently, higher efficiency? The Austrian statistical office, Statistik Austria, provides data on various sectors. We were particularly interested in the following areas: industry, domestic consumption and passenger transport. Fig. 1 gives an overview of the energy efficiency of those sectors between 1990 and 2010. The figures are indexed with 1990=100, and the individual graphs refer to the following quantities: industry means industrial consumption per unit of output, domestic total refes to consumption per household, and passenger transport stands for energy use per passenger-km. Fig. 1 Energy efficiency in Austria. For detailed explanations see text. What do these graphs tell us? The clearest message stems from passenger transport showing a significant decrease since 1990 (83 index points in 2010). That is considerably more than what we have found in the UK. It seems that the Austrian car fleet is more modern than the one in UK. Domestic consumption also tends to become less, though at a much more moderate pace (94 in 2010). It should be noted that those data have not been corrected for temperature effects which can lead to varying energy demand during the winter months. Industry consumption, too, tends to go down over the years, however, with strong fluctuations. 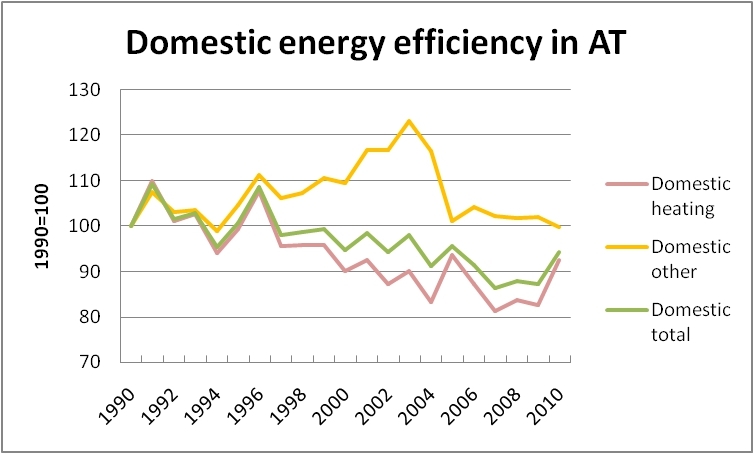 During the economic crisis efficiency seemed to improve a lot (87 in 2008/09). Strangely, during the recovery in 2009 it appears to have become less important and its index rose to 1990 levels (101). After that production efficiency has improved again. We may also have a closer look at domestic consumption. To that end we split up that sector into heating (including airconditioning) and other uses. The results are shown in Fig. 2. Fig. 2 Domestic energy use per household. 1990=100. This figure requires some detailed analysis. First, we note that the graphs for heating and total domestic use are roughly in line with each other. This does not come as a surprise since heating accounts for about 75% of total household energy demand. This dominance tends to cover the huge variations of other consumers of household energy (lighting, kitchen equipment etc.) which do not contribute to the overall trend. On the contrary, other domestic uses reached more than 123 index points in 2003 before a gradual downturn set in. At the end of our observation period we have reached the same levels as in the beginning. That is not what we call a success story. Comparing efficiency figures between different countries is both interesting and enlightening. Nevertheless we should be cautious in interpreting the figures even if they are presented in an indexed form. If country A does very much better than country B it does not necessarily mean that at the end of the day A is more energy efficient than B. That would only be true if both countries started from the same or at least similar levels of absolute efficiency. However, if B was already more efficient than A in the beginning in absolute terms, then, clearly, B needs to make much more effort than A in order to come down by the same number of index points. Now what do we mean by efficiency in absolute terms? It is not sufficient to consider energy consumption per output only, but one has to make sure to be talking about the same amount of output for each country. Thus, if we have GWh/EUR for one country and GWh/GBP for the other we have to make sure that the two currencies are put into relation. We first have to put both countries on the same footing and then are we in a position to analyse their relative performance. In that way, comparing energy efficiency between different countries can be put on a solid basis.